On 30th January 2007 I found that local district heating plant was causing a nice diamond dust display. Temperature was -22 C and the steam crystallized immediately. Only a few hundreds meters from the plant was already a plenty of crystals, but the best was about 2 km from the plant. There I drove to a small road and got out and saw a display like never before. 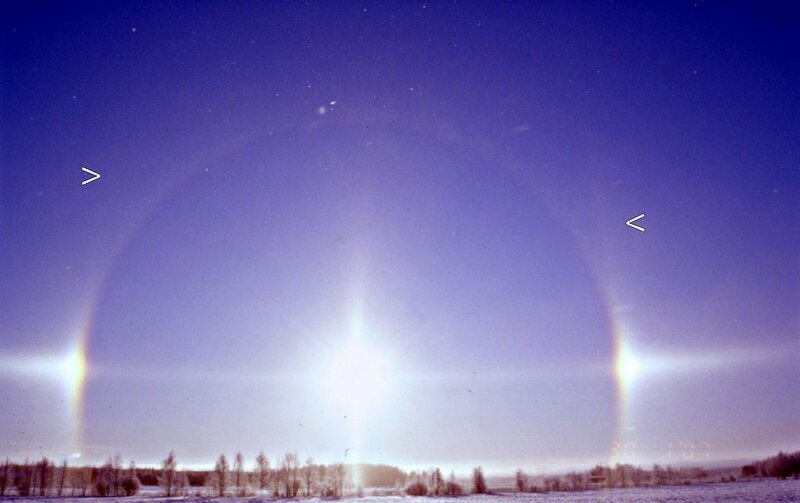 Parhelia were very bright, like fireballs. Also circumzenith arc was bright, but 22 halo was quite weak. Almost full parhelic circle was present with faint 120 parhelia, that looked more like pillars than fuzzy balls. I had a film camera and eventually run out of film. The only choice was to drive home to get digital camera and fisheye lenses. On returning back the display had lost intensity and the 120 parhelia were completely gone. Anyway, I took about 80 photos with digital and later stacking of those photos revealed faint reflected Lowitz arcs rising up from the parhelia (marked in the photos with arrows). More photos of display is here. The looks of the display is quite similar to the one that was observed by Jari Luomanen a year ago. See photo here. I´m very glad to had find this blog, I even put a link on mine to this one (but mine is in Portuguese). 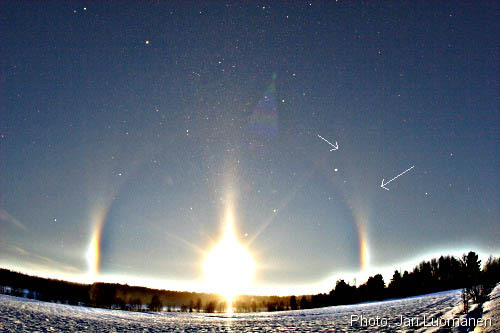 These halos are very very beautiful, it´s a pity that I didn´t see anything more than a 22º circular halo. Marko, this is gorgeous. Thanx for pointing me to this site.